جایزه iF در طول 60 سال گذشته به محصولاتی که دارای نوآوری برجسته ای در مقایسه با سایر محصولات باشند تعلق گرفته است. شرکت کانه موفق گردید 2 جایزه طراحی را برای محصول KSP 858 و سقف مدل RL20 دریافت کند. جایزه iF در طول 60 سال گذشته به محصولاتی که دارای نوآوری برجسته ای در مقایسه با سایر محصولات باشند تعلق گرفته است. در سال 2014 بیش از 3000 محصول برای دریافت این جایزه به رقابت پرداخته اند و جوایز با در نظر گرفتن پارامترهایی مانند متریال , درجه خلاقیت و کیفیت طراحی به محصولات مختلف تعلق گرفته است. تصاویر محصولات به ضمیمه می باشد. KONE has received two coveted iF product design 2014 awards for its innovative KSP 858 touch screen destination operating panel and aesthetic RL20 elevator car ceiling light. The iF product design awards have recognized outstanding achievements in design for 60 years. In 2014, over 3,000 top-class entries were enrolled to the competition. The jury considered criteria such as design quality, choice of materials and degree of innovation when evaluating the entries. 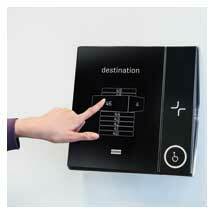 The awarded KSP 858 is a destination operating panel with advanced touch screen. KSP 858 was especially acknowledged for its innovative industrial design: it leaves out the traditional mechanical buttons and replaces them with a touchscreen that makes usage more intuitive and brings greater comfort for its users. "Touchscreens are influencing our interaction with devices more than anything I have seen in my whole career," says Timo Tiainen, Director of Design Solutions, KONE. "As buildings get smarter we need to develop future-forward solutions that are as intuitive to use as possible. Touchscreens and digitalization are the next step towards smart building design." KONE RL20 is a ceiling light whose timeless and minimalistic design fits most new and old elevator cars. A carefully designed lighting solution directs the heat out of the structure, which significantly extends the component's lifetime. The RL20 was entered in a lighting category which usually includes companies specialized only in lighting products. The iF design award continues KONE's success in product design. Previously KONE's products and solutions have been awarded prestigious GOOD DESIGN awards in 2008, 2009 and 2013, four red dot product design awards in 2012. Both RL20 ceiling light and destination control unit and KSP 858 received honorable mentions also in the Fennia Prize 2014.